Building houses with straw bales has seen an amazing rebirth in popularity in the last 20 years or so. 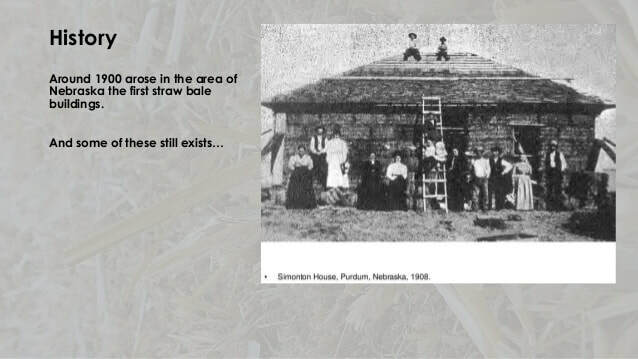 Straw bale construction has it's roots in history in Nebraska, USA, among others. Pioneers encountered good prairie land for farming and wanted to homestead that land. ​The reality of the matter was that not many trees existed there of much consequence for building. One strategy was to cut blocks out of the grass they found in existence on the land and stack the sod blocks into walls, roots oriented upwards. 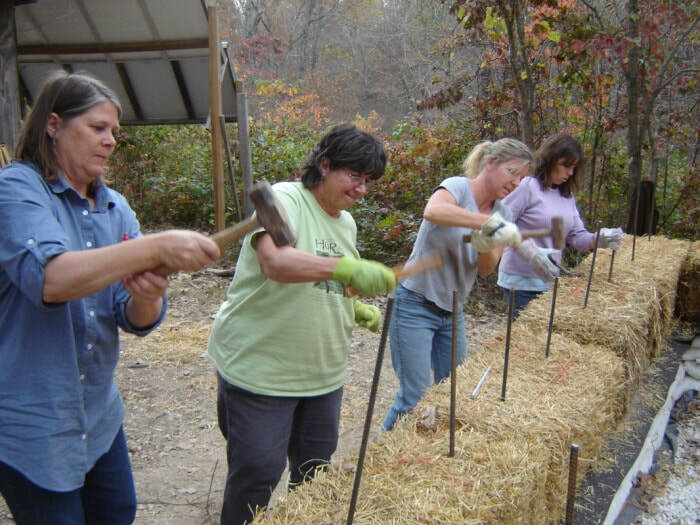 This they could do immediately upon arriving and surely was a precursor of straw bale----straw coming from cultivated crops that took time to organize and grow. New Mexico, USA was an area where sod blocks ( called terrones there by Spanish settlers) were used extensively earlier on. Along the Rio Grande, the river running through the state's center, tough grass grows naturally on the humid flanks of the "big river" and it's canals. Strips were cut from that grass, stacked to make walls, and plastered over with adobe mud. Some of those houses are still standing today and were long lived, when protected from the weather. In Colorado, I made compost for my organic gardens and tried to rot straw by wetting it and layering it with manure to initiate decomposition. It was very hard to humidify and wouldn't wet up for a real long time. So here in Baja California, Mexico, when we got a load of straw bales and stacked them outside, I didn't worry about rain hurting the bales. Was I ever surprised the next day after the rain, when the bales were cooking!! And they were golden, clean wheat straw bales, fully matured in the field, with no visible green matter to spontaneously combust,....but that was what they were doing......heating way up. We went into high gear and set the bales on end to dry them faster. With the high humidity after the rain, they didn't dry out very fast and 40 or so molded heavily, becoming garden mulch, not house. This susceptibility to water should be considered by straw bale builders....how sure are you that your bales won't get wet and heat up? I like straw in my plasters as a binder,....if it rots away, the house stays standing. Or stay with non-load bearing post and beam style straw bale (in my opinion, the only way to go). If the bales go bye-bye, your roof is still supported. The belief that straw houses don't burn is made doubtful by cases like that of our friends in Santiago, Baja California Sur, Mexico, whose house was reduced to ash in a palm orchard fire that swept through their neighborhood some years ago. Their account of watching the house respire as it turned to ash was dramatic & spooky to hear. I've read straw balers say there's no grain in straw bales, but this isn't true. While most grain has been removed in harvest, there is a residual amount present, as I've found when wheat plants have sprouted out of my walls I've coated with straw base plasters. And where the bales have been stored we also have had numerous plants sprout from grain fallen from the bales, so there is definitely grain in the bales and this should be considered if rodents are not wanted in your house. Another big problem with straw bale buildings are the number of people who don't understand the difference between straw and hay. I actually went to a bale house workshop/ build in Taos, New Mexico and was appalled upon arriving to see 200 bright green alfalfa bales stacked waiting to go into the walls. Once they realized the error in choosing bales,they had to hurriedly reload the truck and rush the alfalfa bales back to Colorado in the night and trade them for ones of golden wheat straw, so as to be ready to start the workshop the next morning. This phenomenon has given rise to the phrase, "Hay is for horses, straw is for houses". There no doubt exist homes of highly reactive alfalfa, subject to spontaneous combustion if they ever get wet and thus could catch fire. There are quite a few haystack fires every year when wet hay heats up in farm and ranch haypiles.